The much loved premium German spirit brand Jägermeister is launching two new RTDs to the Australian market, the first ever Jägermeister line extensions in the brands 77 year history. For the first time ever Jägermeister will now be available as a convenient, premixed ready to drink in a take home format. Jägermeister Ginger Lime – a refreshing blend of Jägermeister combined with 100% natural ginger root and fresh lime creating a refreshing mix of bitter and sweet. “We’re really excited about this launch as we know it’s what Jägermeister drinkers have been waiting for. People love the unique taste of Jägermeister and want to enjoy it in different ways outside of the usual bar environment with friends – home, parties, and barbecues. Last year we introduced the Jägermeister & Ginger Beer as an on premise long drink, which was really successful, the new RTDs are part of that evolution for the brand in Australia” said Michael Bouda, Jägermeister brand manager, Suntory. The packaging takes inspiration from the Jägermeister bottle design featuring the stag head which refers to the legend of St. Hubertus the patron saint of hunters. 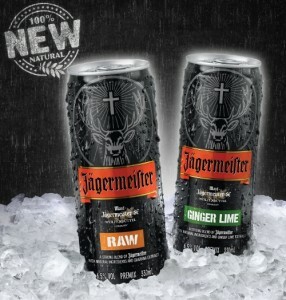 Jägermeister RAW and Jägermeister Ginger Lime are available from all good liquor retailers around Australia from August with a RRP of $19.99 per 4 pack x 330ml cans.